Maybe this post could be more appropriately titled "Country Meditations", or "My Bucket List". Or even more simply, "I'm Getting Old". Or better yet, "Posting Because I Haven't Been Diligent On Posting". Ok, so it's a post about all the above things. Sort of. If it's incoherent and rambling, suffice it to say you've been warned beforehand. Why am I working two jobs? Simple answer: To get out of debt. More complicated answer: To get out of debt and live some dreams. How long will I continue to work two jobs? I dunno. I wish I had the answer to this question. So, what are my dreams since I don't have as much of life to live said dreams? There really is no simple answer to this question. Of course, there are simple, easily accomplishable dreams, e.g., a trip to the fantastically beautiful Pacific coast to visit family. 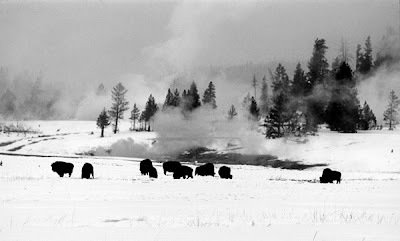 A winter trip to Yellowstone ~ I've been wanting to make this trip for many years now. I've been to Yellowstone 3 or 4 times in the summer, but I would love to see its breathtaking snowy beauty. Even better ~ to combine a winter trip to Yellowstone with a photography class! Then there are more difficult-to-attain dreams, such as getting a tractor to work our property, grow our own hay, have a much larger garden with more variety, maybe even have our own small CSA someday. Then there are the real pie-in-the-sky dreams, such as getting a really good roping horse for the hubby, sending him to a fantabulous roping school in Texas for a few weeks and then travelling the team roping circuit. Yeah, that one's a tough one, primarily because it involves many dollars. Who would have ever thought that I would be living in the Kansas outback on 27 acres? Perhaps that wasn't a conscious dream of mine -- I never thought "hey, I want to live in Kansas", but here I am, and ever so happy that I have this little piece of paradise to come home to every single day. I think it helps make working two jobs just a tad more bearable. So I'll keep working my two jobs as long as I can to pay off as much debt as possible and build some savings toward our dreams. I'll remind myself to grab a little bit of "me" time everyday before I head off to work -- whether that "me" time is posting on my blog, visiting a few friends' blogs, spending time with our dogs and cats and horses and guineas, or playing with my new video recorder or my camera. Photography is still my first love but I've had precious little time to indulge in that hobby lately. So, what are your dreams? Are you taking steps to make some of your dreams happen? Now I want to go to Yellowstone. I can't seem to find even one job, sigh...so our dreams have been put on hold for the time being. Yellowstone is on my list of places I want to see. Maybe someday. Take care of yourself and don't work too hard. I admire you for working so hard to clear your debt, it'll be worth it. I also want to go to Yellowstone, never been and it's a dream because of photography too. I achieved a few of mine this year, citizenship and starting a photography business, so I'm done for while :-) Love the picture of your family! My dream is to visit every single state in the US. I've always wanted to go to the Kentucky Derby and a NY Yankees Baseball game. But until then, I'll just wish for lots of little mini get aways. I hope your dreams come true. Oh, and I forgot to mention, you take some of the most beautiful pictures I've ever seen. They take my breath away. I love Yellowstone. Would love to go back someday. I have many dreams, but I doubt any of them will happen for me. At least not anytime soon! Working a second job is tough, I did that once and I will never do that again! You go girl! 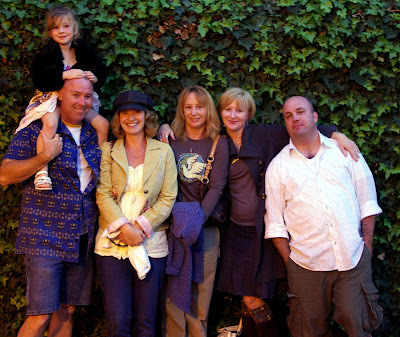 And what a beautiful family you have!! We are on hold until J graduates from school next year. It has been a loooong two years since he decided to go back to school and add to his first degree. I do know it will be worth it and I am excited for our future! But, geeeeeez. Sometimes it seems as if it has been forever! Belated Happy Birthday! So being 50 is cause for all this dreaming...you keep working on that debt! 50 gets better and better!! The best feeling is working on the debt and look back and say "wow, i actually have accomplished my dreams." Keep working on getting your debt paid off. You'll get there and feel such a sense of accomplishment when you do. My dream is to one day visit the UK. You go girl...I'm one who still believe that dreams CAN and DO really come true!!! The other one is to get my horse in a relaxed mode again. Working on that too. She's a bit too skippy sometimes. It must be the thoroughbred blood and her hormones. I can relate. About the hormones that is. Good luck with your dreams. May they all come true.